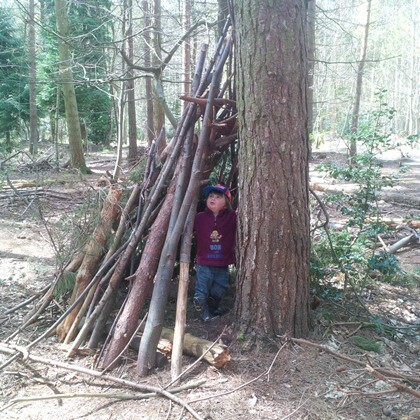 Will Clennell, Education Coordinator for Holkham Estate, Norfolk, gives us a fantastic peek into his world and the inspiration that an outdoor education (even just a day!) can give young people…. Having two Biology teaching parents, I suppose an inclination towards nature and the outdoors was always a strong possibility. There was certainly every opportunity for me to be inspired by the world outside the walls of home or school. Long summers spent camping in a farmer’s field on Anglesey, with only a cold tap and a primitive chemical loo at our disposal, initiated me in the sensory abundance that the natural world has to offer. The small tribe that my friends and I became, trekked every inch of the rocky coastline and endless estuaries, barbecuing freshly caught mackerel and munching on samphire, losing wellies in the ‘quick sand’. It wasn’t some Arthur Ransome style idyll – it rained endlessly, there were squabbles, chickenpox, mozzie bites and diarrhoea – but we loved it and we discovered amazing things every single day. Now, having veered naturally, it seems, onto a career path that involves working in some fantastic habitats, with children and young adults, I see the importance of our relationship with nature increase on a daily basis. Screen time, in its various forms, undoubtedly has great educational and developmental benefits. In fact, children probably read more today than in any previous generation, something which can only help literacy levels. Fine motor skills, logic and resilience are all beneficiaries of the technological age. Pokémon Go can even boast of encouraging fresh air and exercise. However, the first sight of a Cinnabar Moth, the smell of a freshly plunged pond dipping net, the realisation that every part of every creature has a specific purpose, the recognition of a ‘yaffling’ Green Woodpecker – none of these things can be experienced without being outside, in the real world, discovering nature. My current job, as Education Coordinator on the Holkham Estate, has given me the opportunity to share and enjoy some of the finest natural habitats the country has to offer with children from all over the region. The whole spring and summer terms are spent hosting educational visits from local and not so local schools. One day I might be looking for mini-beasts and building dens with four-year old Reception pupils, the next I could be completing a detailed survey of psammosere succession with A-Level Geography students. The diversity of habitats to which we have access has enabled us to really diversify the sessions we offer to visiting schools. Our aim is quite simple. A school visit to Holkham should be the highlight of each child’s school year and they should go away inspired by the outdoor setting and with a love of and appreciation for nature. Holkham National Nature Reserve (NNR) is one of only a few privately owned NNRs, the estate having taken over the running of it from Natural England in 2012. The place really is one to inspire young minds – all 3,706 hectares of it. We can take our pick of 18km of coastline, but most groups come to explore the wonderful beach and pine woods at Wells-next-the-Sea or salt marsh, sand dunes and grazing marshes along the shore at Holkham Bay. Here, pupils really can feel alive and free – no SATs pressure, no Googling and definitely no boundaries to their learning. Pupils from EYFS and Key Stages 1 and 2 will arrive clutching packed lunches and fully clad in waterproofs and wellies. We head off through the pines to our base camp deep in the woods. Children’s senses are so well tuned that they don’t miss a thing. Everything they experience they do so with freshness that rarely persists into adulthood. The shapes of the leaves, the patterns the shadows cast, smells fragrant and putrid, trilling songbirds, dancing butterflies, a Muntjac dashing into the undergrowth. These things all happen before any teaching has begun. Give a child the right environment and they need little else but the odd nudge. Encouraging observation we will talk about the habitats we spend time in and the ecosystems they support, before heading off in search of natural treasures, many of which may seem simple but are transformed with a little imagination. Who has been drilling holes in this old branch? Why is this leaf half golden and half green? What’s this frothy ball of spit doing on this plant? Once we have settled in to this temporary woodland home, it’s time to discover more of the creatures who live here. With pooters and magna-jars in hand excitement reaches a crescendo and groups return to the tarp’ with trays full of woodlice, ground beetles, spiders and slugs. Millipedes, centipedes, shield bugs and grubs all join the party and we’ve even been lucky enough to find Lesser Stag Beetles amongst the leaf litter. Not only are these young minds set on fire by exploration outside the confines of the classroom, but many key developmental and cognitive skills are practised. Teamwork, empathy, awareness, resilience and logic all come centre stage when nature is itself the teacher and the classroom. An unsettling, but perhaps not entirely surprising, occurrence has been the fact that not just one but numerous children, some in their teens, have never previously seen the North Sea, despite living within 15 miles of it. Similarly, rural pupils visiting our farmland often have no knowledge of its workings, produce or relationship with the natural environment. Once a little natural magic has rubbed off on these visitors, they cannot believe what they have been missing, often to the extent that they pledge to make the newly explored habitats their workplace of the future. Having one of the UK’s finest beaches to work on with young people is really quite a privilege. Whatever the weather decides to do – and it changes minute by minute – the huge skies, endless sands and Star Wars style lunar-scape of the sand dunes never fails to leave an imprint on our visitors. We trawl the strandline for whelk egg cases, razor clam, cockle and oyster shells and are occasionally lucky enough to find larger curiosities such as jellyfish, starfish and the unfortunate skeletons of gulls and guillemots. All these provide inspiration for sand sculptures – not your run of the mill castles here, but creatures from the depths decorated with bladder wrack, driftwood and crab claws. Back at the Deer Park it’s time to build dens under the awnings of the 300 year old oaks, wonder at the Red and Fallow Deer and scoop up leeches, caddisfly nymphs, roach fry and water boatmen from the silty depths of the estate lake, whilst the Buzzards and Red Kites ride the thermals above us. Although a managed and landscaped environment, so not totally wild, the abundance of nature which has thrived here is enough to make young jaws actually drop. Barn Owls are numerous and dissection of their pellets is a top-rated thrill with primary and secondary school children alike. Brown Hare, Grey Partridge and Skylark are also resident in large numbers, enjoying the three-metre wild flower borders grown on every field of our farmland. For at least a couple of decades field study trips and practical work for secondary aged biologists and geographers became as good as non-existent. Thankfully, the exceptional value of this work seems to have once more been recognised and so we are using this resurgence to fulfil the potential of the estate’s land and bring advanced studies out once more into the field. 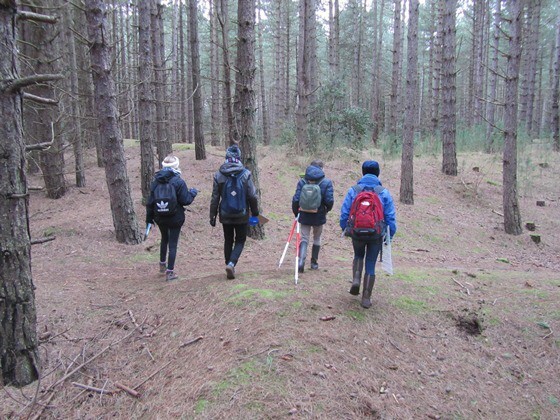 We look at psammosere succession, conservation management, biodiversity and ecosystems, woodland ecology, renewable energies and coastal processes with both GCSE and ‘A’ Level students at sites all over the 25,000 acre estate. Fashions may have come full circle, with students arriving seemingly caught in a 1980s time warp, but they inevitably leave invigorated by the new skills they have learnt and put into practise, a hatful of important data to take back with them and a renewed thirst for their subject. Getting down to business in gale force winds, with clinometers, soil thermometers, quadrats and identification keys and a good old sandy box of sandwiches is the stuff that dreams, and careers, are made of. Here in the United Kingdom we have so much wonderful habitat for our young people to explore. If the opportunity is not there, or not pushed onto them, however, there is a risk that these natural wonders will be missed by another generation. The benefit of an outdoor education is clear and obvious. It has so much more depth than merely what the National Curriculum requires schools to provide. It inspires and is inspirational. It must be a part of every child’s life. Previous ArticleField identification skills: why should I bother?